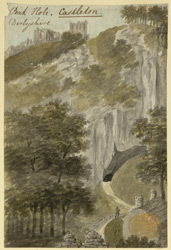 View of the approach to the entrance to Peak's Cavern near Castleton in Derbyshire. There are many natural caverns in the limestone cliffs around Castleton, and Peak's Cavern is the largest and most visited. The cavern has sometimes been called the 'Devil's Hole' because of its gloomy and atmospheric situation. The cavern was so large that it was used as a workshop by rope makers in the 19th century. The River Styx, also know as Peaks Hole Water has its source in the cavern, and streams out of the cavern, creating a picturesque approach for visitors.